On Thursday August 21st, my brother-in-law Kurt, friend Zach, and I hiked the chain Lakes Trail near Mt. Baker. It’s a moderate trail that ranges from easy to difficult. In fact, the last two miles of the trail is downhill. Along for the fun was Zach’s dog Domino. 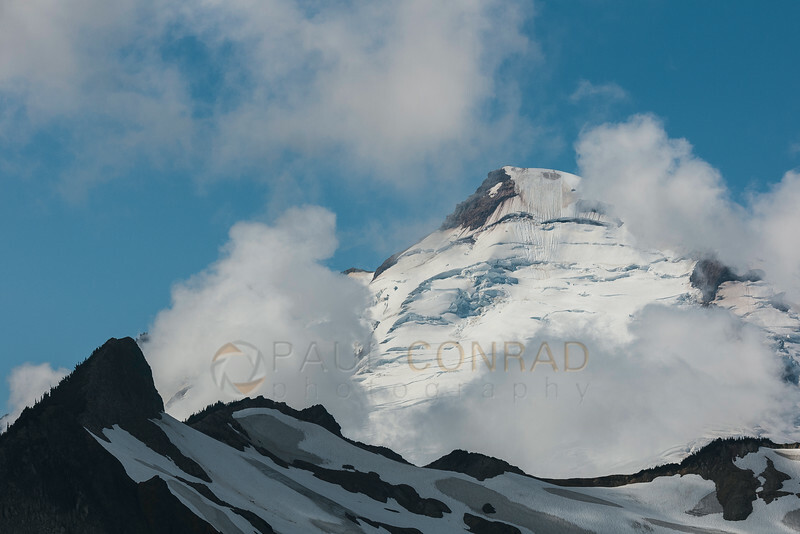 © Paul Conrad/Pablo Conrad Photography – Coleman Pinnacle, left, and Mt. Baker from Ptarmigan Ridge. We hiked about 1/2 mile down the trail before turning back to Chain Lakes Trail. Starting at Artist’s Point, we began the 7 mile loop at about 10:30 in the morning. It was cool and breezy. The sky was deep blue with patches of clouds around Mt. 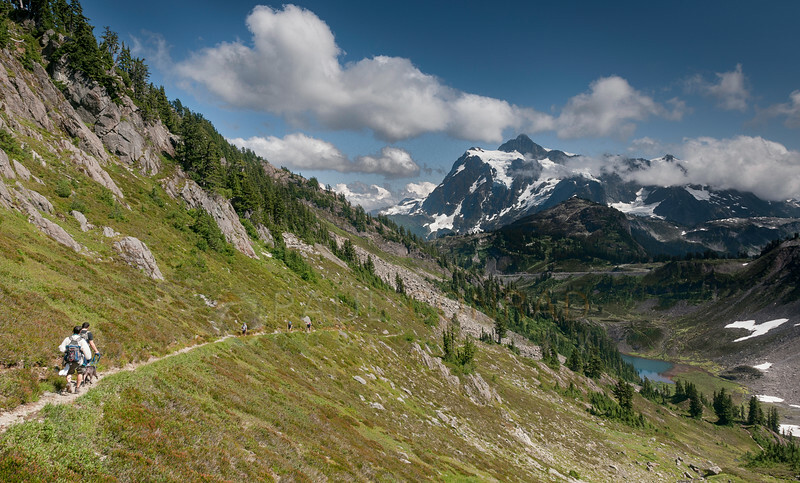 Shuksan and Mt. Baker. You can see steam rising from Sherman Crater. 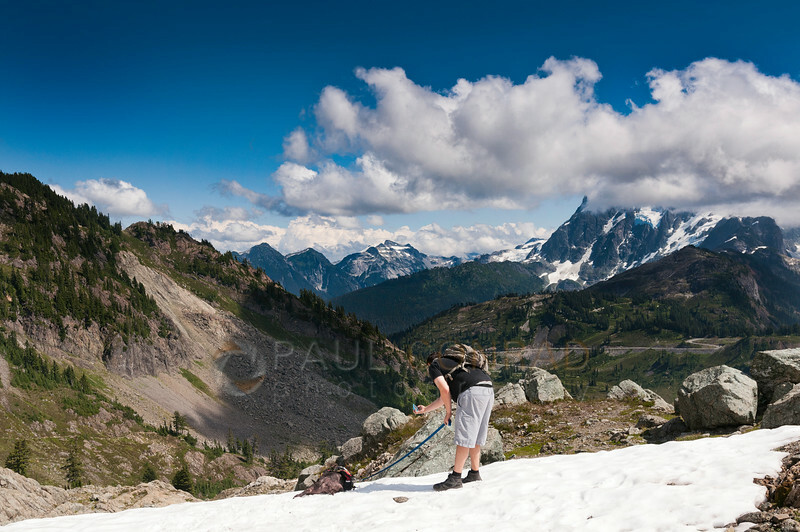 © Paul Conrad/Pablo Conrad Photography – Kurt passes a patch of fireweed as we approach Ptarmigan Ridge. The crater is the active part of Mt. Baker. For those who don’t know, Mt. Baker is the second most active volcano in the state of Washington. Right after Mt. Saint Helens. Booyah! Scenes from “Dante’s Peak” came flashing in. How does one outrun a Pyroclastic flow? 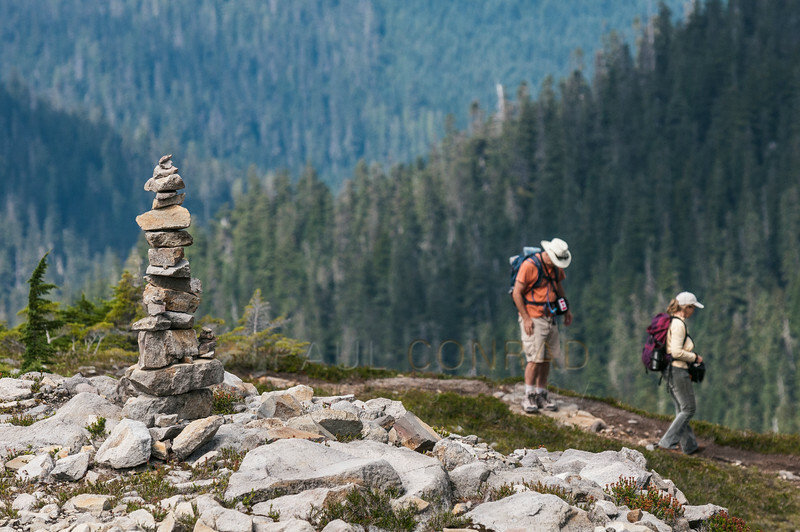 © Paul Conrad/Pablo Conrad Photography – A couple pause at a cairn along the Chain Lakes Trail several hundred yards past the Ptarmigan Ridge turn-off. I came around the corner and saw them then the cairn. I used a shallow depth of field to set them against the forest. I packed as I’d normally pack when going on a day hike: a little too much. I used my Camelbak with a 100 oz. bladder full with fresh water, Petzl headlamp with fresh batteries, light jacket, compass, gloves, water filter, Leatherman knife, regular knife, eating utensils, protein bar, protein shake, jerky for snacking, and trail mix. © Paul Conrad/Pablo Conrad Photography – Coleman Pinnacle, left, Mt. Baker in clouds, and a few other peaks looking west from the trail. In the pack I also carried my 55mm f/2.8 macro for close-up shots in a soft pouch inside a waterproof bag, my Nikon SB-910 flash, SB-29 off-camera cord, my D300s, my 17-35 f/2.8, lens cleaner and cloth, and an extra battery. As weight was a bit of an issue, I left the tripod at home. 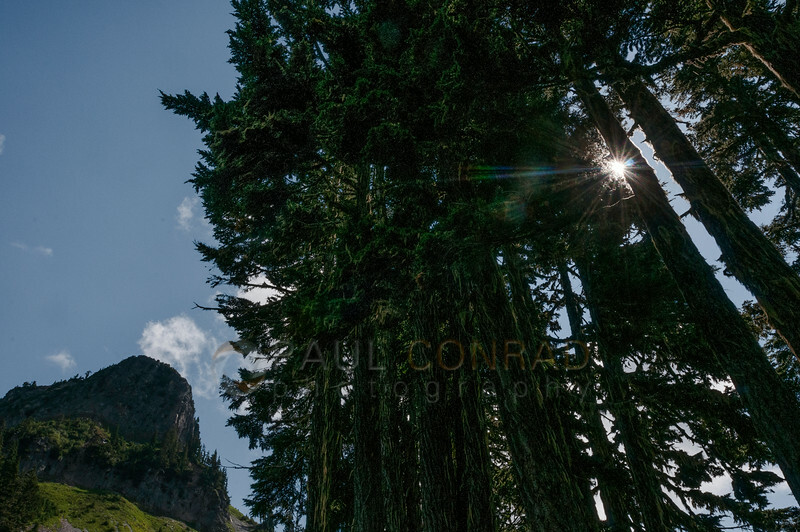 © Paul Conrad/Pablo Conrad Photography – The Sun forms a starburst through a grove of pine with the southern cliff face of Table Mountain on the left. I worked this to try to get the starburst. The aperture was at f/22 on my 17-35. The weight in the pack was nominal, but I like to be prepared: both photographically and in case of an accident. © Paul Conrad/Pablo Conrad Photography – This was a pain to get. I was laying on the ground, holding my camera with one hand, and lifting myself enough to get the fireweed to line up with the tree line. Aperture on my 17-35 was at f/5.6 and at 17mm. After heading out, it was clear the photo ops would be phenomenal. The wildflowers were still in bloom, the sky fantastic, and although the light was mid day, it was just gorgeous. As we hit about a mile out on the trail under the ridgeline of Table Mountain, we saw Mt. Baker in the distance over Ptarmigan Ridge with Coleman Pinnacle jutting into the bluebird sky. The passing clouds framed it wonderfully. The scenery towards Baker Lake was stunning. 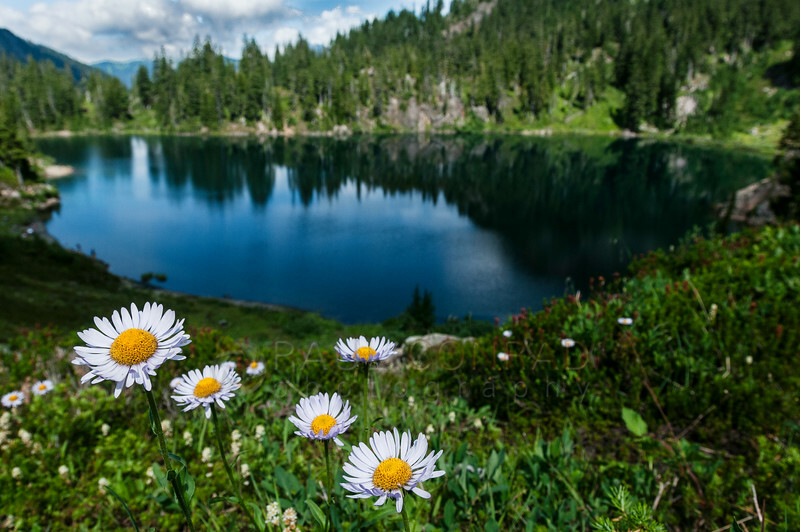 © Paul Conrad/Pablo Conrad Photography – Blue asters above Iceberg Lake along the Chain Lakes Trail. I used my 17-35 at 17 mm with an aperture of f/11. These are tiny flowers so I had to get super close. At f/11, it gave me sufficient depth of field to get the lake and surrounding mountains visible, but not overpowering. I like how they’re a little out of focus. Along the way there were some small patches of Fireweed, asters, and daisies. I’m no horticulturist, but I’m certain they’re daisies. 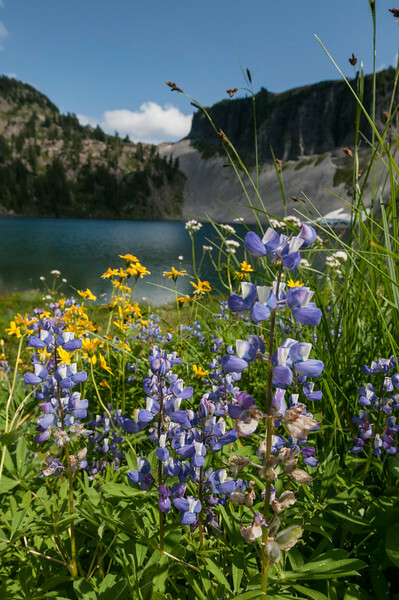 As we walked between the lakes, the wildflowers were amazing. 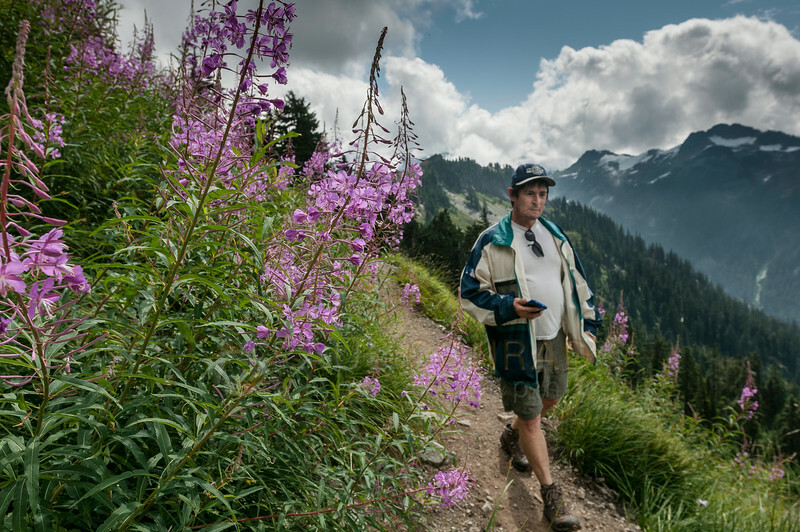 The fireweed were tall, the asters stunning, and the scenery unbeatable. Even this Colorado boy was stunned by the backwoods beauty. 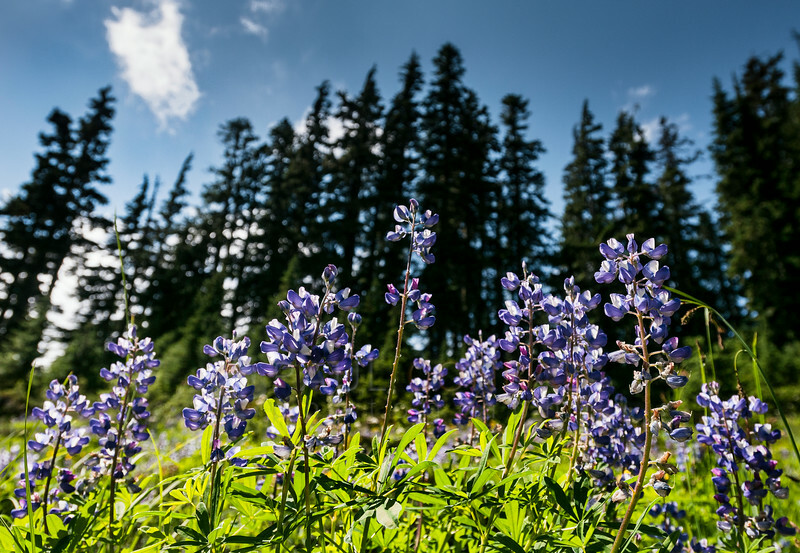 © Paul Conrad/Pablo Conrad Photography – Wildflowers along the shore of Iceberg Lake. While we took a break at Iceberg Lake, Kurt decided it was time for a bath, well, sort of. He went to the water’s edge as he wanted to jump in. Instead after feeling the chill, he opted to cool down and wash his head. A wise move since we didn’t bring any blankets. And I wasn’t going to cuddle with him while he warmed up. LOL. © Paul Conrad/Pablo Conrad Photography – Kurt shakes off the icy cold water after dipping his head in Iceberg Lake. It’s called Iceberg for a reason Kurt. 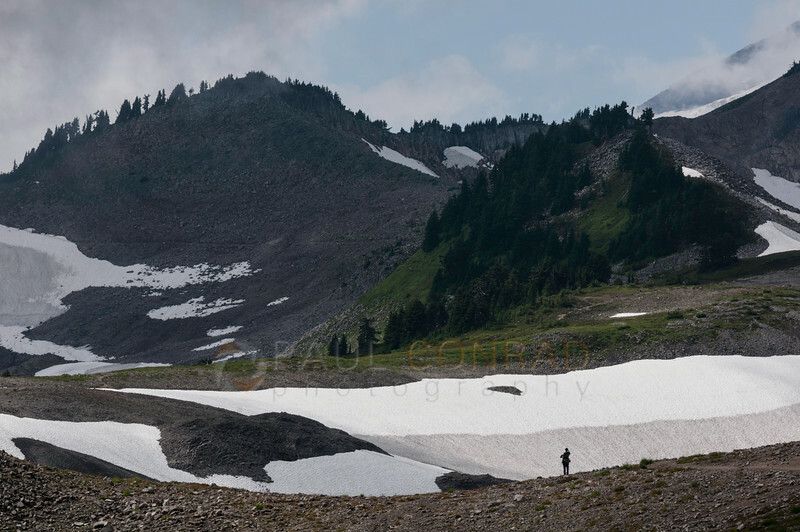 After the lakes, we continued onto the trail which followed the saddle between Table Mountain and Mazama Dome. This provided a splendid view of the valley towards Mt. Shuksan. © Paul Conrad/Pablo Conrad Photography – Taking a break in Herman’s Saddle, Zach takes photos of Domino as he lays in a snowfield. The peaks of Mt. Shuksan are shrouded by clouds. You can also see the road to Artist’s Point on the left. You can see Mt. Sefrit and Nooksack Ridge in the background. From this viewpoint, it was pretty much downhill. Seriously, it was about 2 miles of downhill trail. Relatively easy-going. Unfortunately, Domino began getting tired and as a result, slipped on some sharp rocks and earned a slight cut. He was limping, but still strong. 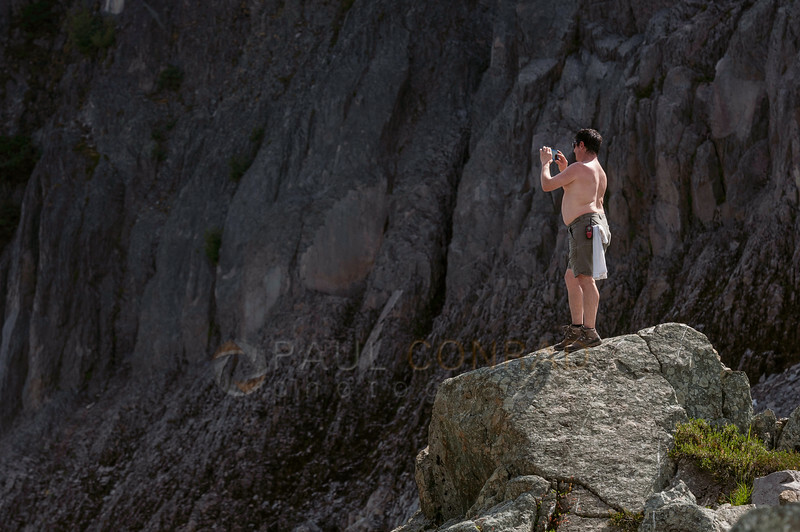 © Paul Conrad/Pablo Conrad Photography – Kurt climbs atop boulders on Herman’s Saddle to try to find an easier route back to Artist’s Point. We opted to stay on trail. During one rough section, in order keep him from hurting his foot any more, Kurt carried him about 50 yards through one part of the trail that was bedded with sharp rock. 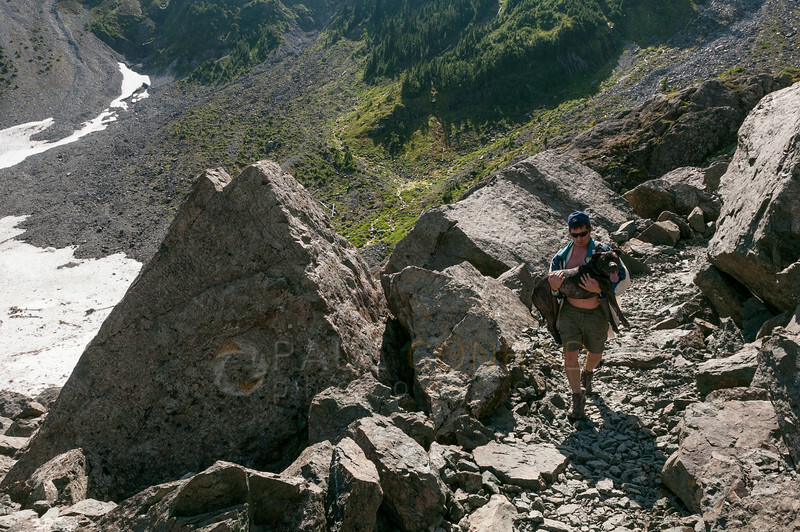 © Paul Conrad/Pablo Conrad Photography – Kurt carries Domino through a rough part of the trail that was covered with sharp rocks. Half way down, we paused to take a break. We found a small grassy area to chill. This gave Domino a little time to recoup as we also caught our breath and reenergize with some trail snacks. Domino thought it was his playground and just did what dogs like to do, rolled around in the grass. 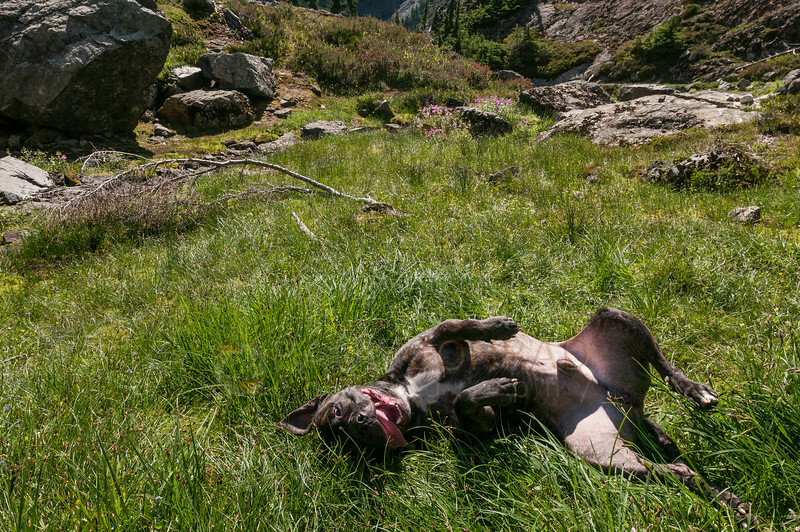 © Paul Conrad/Pablo Conrad Photography – Domino finds a little joy while rolling around in a grassy patch along the trail. Exhausted and beat at the end of the hike, I already decided I want to backpack in and spend a night at the lakes shooting the stars and trying to capture some of the Aurora Borealis we can sometimes see from Bellingham. 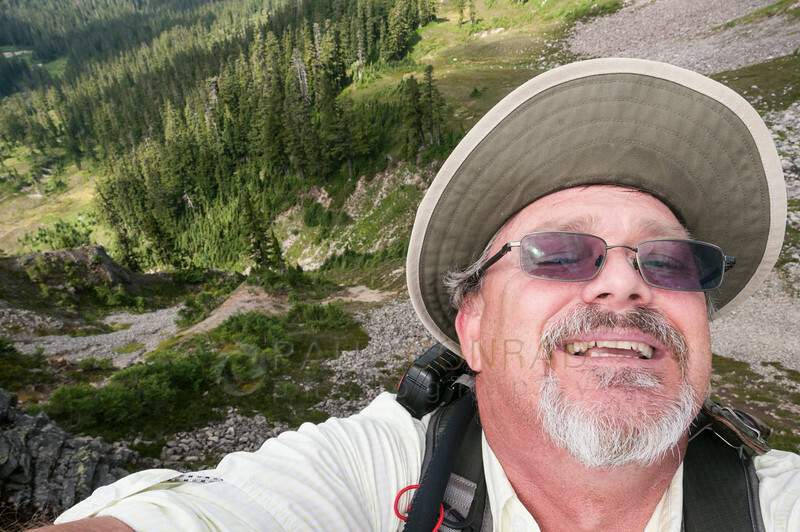 © Paul Conrad/Pablo Conrad Photography – Had to stop for a selfie of me against a valley. I was about a foot from a cliff edge. No worries, I made it out safely. © Paul Conrad/Pablo Conrad Photography – Kurt, Zach, and Domino head down the trail after we leave Herman’s Saddle. The view was fantastic. The light, clouds, sky, and greenery worked well together. 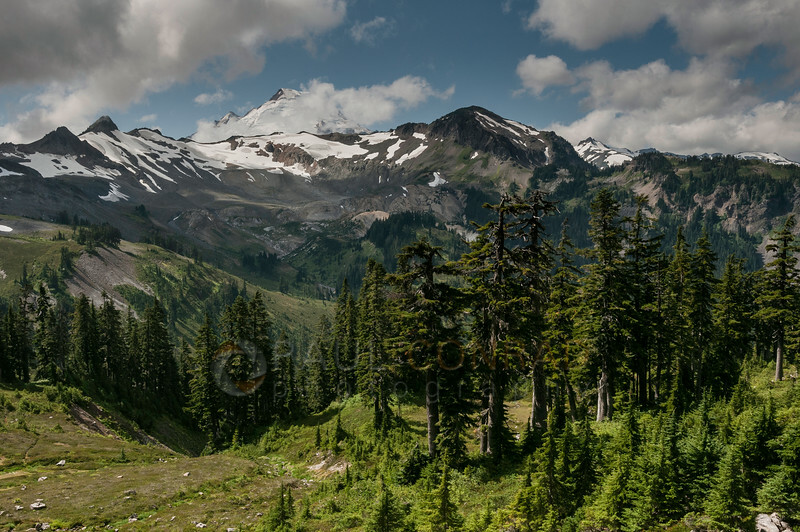 Paul Conrad is an award-winning, nationally published freelance photographer living in Bellingham, Wash., in the Pacific Northwest. His work has been published in newspapers and magazine throughout the United States and in Europe. His specialty is photojournalism covering news, sports, and editorial portraits, he also is skilled in family portraiture, high school senior portraits, and weddings. He is available for short and long-term assignments.